Valentine's Day is right around the corner. We always try to do some fun things with the kids to celebrate. 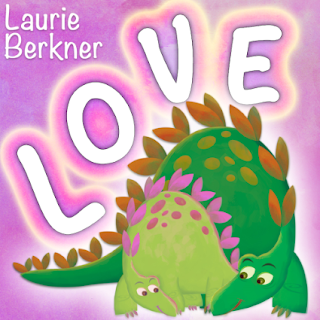 Laurie Berkner's newest album LOVE is the perfect soundtrack for the holiday. This album is being released as a digital copy only and features songs picked from various albums all with the love theme. Some of my favorites are on here like I Love My Rooster and Blow A Kiss. Goodnight is one of my all time favorites from Laurie. This is a sweet album and a great sampling of songs. Best-selling children's recording artist and preschool television favorite Laurie Berkner will release a fully remastered digital album, Love, on January 29, in time for Valentine's Day. Featuring songs performed by Laurie Berkner and personally selected from eight of Laurie's best-loved albums, Love celebrates that mysterious force that makes the world go 'round while showcasing a world-class voice gracefully delivering a virtuosic range of moods and musical styles. The Laurie Berkner Band features: Laurie Berkner, vocals/guitar; Susie Lampert, keyboards; Brady Rymer, bass; and Bobby Golden, drums/percussion. Visit Laurie Berkner's website HERE for more about the band, including press photos and tour dates. Media assets and press photos are also available on the website of Laurie's distributor, Razor & Tie, HERE. Love will be available for download at all digital retailers, including iTunes, Amazon, Google Play, Spotify and more. "You've Lost That Lovin' Feelin'" by The Righteous Brothers! My favorite love song is We've Only Just Begun by the Carpenters.